a girl who has a love for books, and very literally turned her closet into a library. About Me and the Blog! Why? Why did Liz Emerson decide that the world would be better off without her? Why did she give up? Vividly told by an unexpected and surprising narrator, this heartbreaking and nonlinear novel pieces together the short and devastating life of Meridian High’s most popular junior girl. Mass, acceleration, momentum, force—Liz didn’t understand it in physics, and even as her Mercedes hurtles toward the tree, she doesn’t understand it now. How do we impact one another? How do our actions reverberate? What does it mean to be a friend? To love someone? To be a daughter? Or a mother? Is life truly more than cause and effect? Amy Zhang’s haunting and universal story will appeal to fans of Lauren Oliver, Gayle Forman, and Jay Asher. This is a phenomenal book. I have had to wait a while to write this review because when I finished the book I couldn't put my thoughts and emotions into words. Teenagers and their parents should pick up this book and read. This is a heartbreakingly real depiction of a teenager going through depression. The writing in this novel was beautiful. I always felt it had a little bit of a poetic feel to it that added more emotion to the process of reading. The chapters themselves are actually only like 2 to 5 pages. This made it easy to sit down and continue to flip the pages. I read this book in one sitting. The writing was lyrical, intriguing and had an easy flow. The story flips back and forth between the current situation of Liz Emerson in a coma and what is going on with her friends and family out in the waiting room to flashbacks of events and experiences that slowly led up to Liz's choice to drive her car off the road. This was a perfect way to write the story because you get to see Liz unravel. It is a fantastic portrayal of how all actions have an impact on life. The most important part of this story is the actual emotions showcased. Zhang is able to illustrate depression and it symptoms. And the great thing about this book is even if you can't relate to the specific events happing to Liz and her friends you can relate to all of their emotions and thoughts. In a majority of the flashback scenes you really get inside of Liz's head and see what she is thinking and what she is feeling and that was crucial for the story. Liz is a classic teenager who acts fine on the outside but on the inside is breaking. I highly suggest this book for any teen struggling with any sort of depression, any parents or friends who have a teen who is struggling, as a read for advocating for teen depression, or just as a fantastic and breathtaking read. Liz's story is a beautiful representation of a serious epidemic in teens that gets sugar coated way too often in society today. Zhang's debut is honest, emotional, and I can't wait to read more of her work. I'm with you on this! 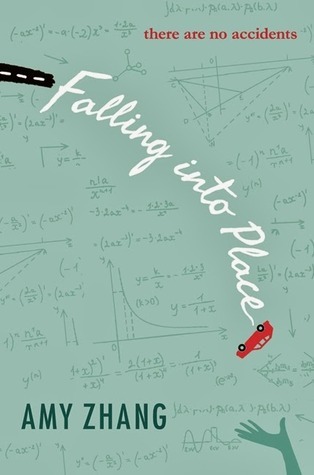 Falling into Place is such a powerful, beautifully written debut, and I agree with you; through the flashbacks, it's easy to see how Liz is crumbling inside behind her facade. Even if you haven't personally experienced what she's going through, I felt that the emotions behind it were largely universal, and the story on the whole is so moving. In other words: this is a marvelous review for a marvelous book. :) Thanks for sharing! This actually sounds like I might enjoy it but I just never bothered to pick it up. Great review! Welcome readers! I am the founder of The Closet Library book blog, thanks for visiting! I am also the president of my library's teen advisory board located in New England. This blog is my own personal blog. Here is where I write reviews of different book titles (usually YA). I love to share my general love of books and reading with all of you guys! If you are interested in me reviewing your book or being part of an event, please check out my policies page to find out more. Thanks for reading and come back again! All of the reviews and opinions I write on The Closet Library blog are my own and honest opinion.